Have you ever wondered where irises come from? Well, we all know they come in a box from Oregon via UPS. But I mean a little farther back than that. How did these particular plants evolve? How do they fit into the long history of life on Earth? How did they come to have so many shapes, colors, and sizes, and spread to so many different continents and climates? Iris is a wonderfully diverse genus, with between 200 and 300 species. 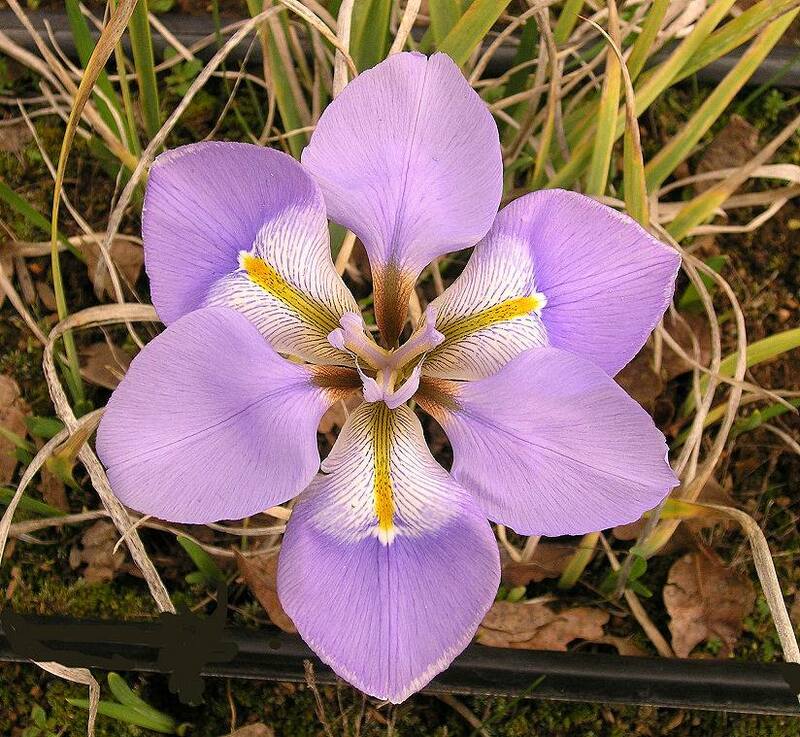 And it is part of a larger iris family (which botanists call Iridaceae) that includes something like 2000 species, including other familiar garden plants like the crocus and gladiolus. Early botanists tried to deduce the family trees and family history of plants by noting their physical similarities and what clues could be gleaned from fossils. In this century, much has been learned from DNA studies, giving us a more complete picture of plant evolution. 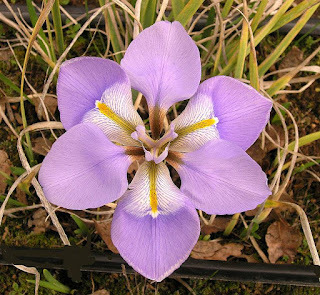 Peter Goldblatt of the Missouri Botanical Garden has taken a special interest in the Iris family, and Carol Wilson of Rancho Santa Ana Botanical Garden has studied the genus Iris itself in more detail. I’ve relied heavily on their work in putting together this post. Origin of the Iris Family. Like many families of flowering plants, the iris family has its beginnings in the late Cretaceous period. At that time, the Earth’s climate was about 8C (15F) warmer than today, and there were no polar ice caps. Sea levels were high, and many areas were covered by shallow inland seas. It was a time when flowering plants were spreading throughout the world. They were diversifying and evolving rapidly, both encouraging and encouraged by the simultaneous evolution of bees and other insect pollinators. 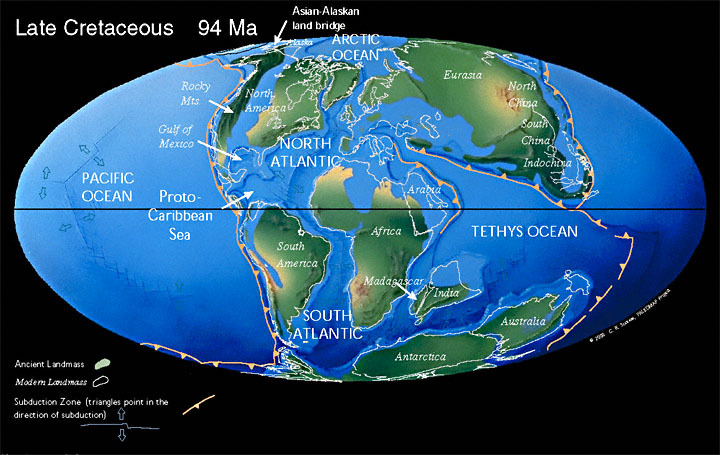 The iris family probably got its start about 82 million years ago, in what is now Antarctica. Around the time these different branches of the iris family were evolving away from one another and beginning to develop their own separate identities, the Earth experienced one of its great mass extinctions when a meteorite struck the Earth in what is now the Gulf of Mexico, 66 million years ago. Most people think of this event in connection with the extinction of the dinosaurs, but its effects were much more far-reaching than that. Many species of plants that depended on photosynthesis were driven to extinction by the dark envelope of dust that shrouded the Earth following the impact. Fortunately for the iris family, Antarctica, Australia, and South Africa—on the opposite side of the globe—were the best place to be. Although it is estimated that more than half of North America’s land plant species were lost in the extinction, few if any species were lost “down under,” although the numbers of individual plants plummeted. With Antarctica moving south and the world growing colder, the future of the iris family now belonged to these plants that had colonized Africa and other warmer lands. Two of the types of early irids (members of the iris family) in south Africa turned out to be very successful, spreading to other parts of the globe. These are also the branches of the family most familiar to gardeners today: iridoids and crocoids. Iridoids and Crocoids. No, they are rival not alien factions from Dr. Who. The iridoids are members of the iris family related to irises, and the crocoids are members of the iris family related to crocuses. The iridoids include irises, as well as other familiar genera like Tigridia, Sisyrinchium, Moraea, and Dietes. A prominent distinguishing feature of the iridoids is their wide, arching, petal-like styles that cover the anthers and end in a crest. We can picture this emerging as an especially effective way to channel bees into the heart of the flower. The crocoids include crocuses of course, but also Romulea, Ixia, Tritonia, Freesia, Crocosmia, and Gladiolus. It’s hard to imagine a stylish modern garden without at least of few of this crew. 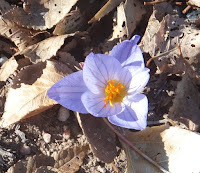 Crocus, Romulea, and Gladiolus eventually found their way north into Eurasia from their south African origins, but it was the iridoids that eventually made it all the way to the Americas. Iris. In the iridoid clan, the closest relatives to the irises themselves are the South African Moraea, Dietes, and related genera. Iris separated from these genera about 45 million years ago. The great sea that had divided Africa from Asia was gradually narrowing and vanishing, perhaps allowing the ancestors of the irises to find a new home in Eurasia. Later, the Sahara and Arabian deserts would prevent their return south. Turkey seems to be the center from which the genus Iris has spread throughout the northern hemisphere. Many different types of irises are found in Turkey today, whereas most other regions have just a few local species. For centuries, botanists had assumed that the most fundamental divisions of the genus could be seen in the different rootstocks: Junos with their bulbs and fleshy roots, xiphiums (which include the Dutch irises so popular with florists) with their tulip-like bulbs, the small reticulatas with their bulbs covered in netting, and of course those that grow from rhizomes. 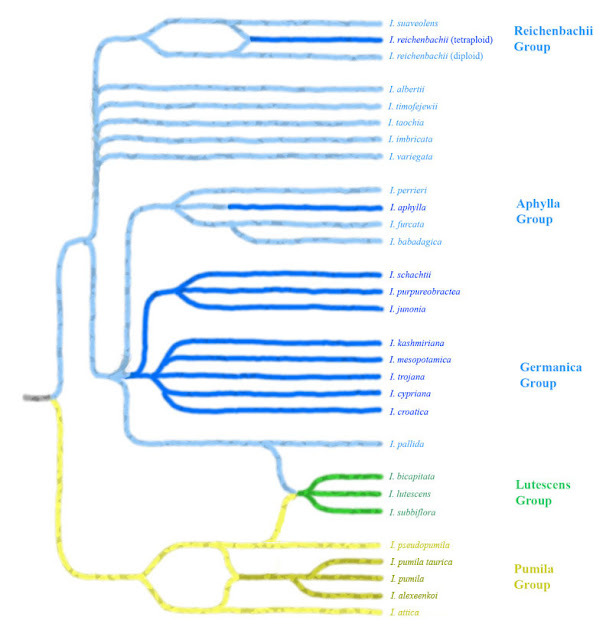 Some botanists even put these groups into different genera based on their rootstock. The rhizomatous branch of the genus was presumed to have then split into beardless, crested, and bearded sorts. the newest version of the oldest iris? What has become clear recently is that these different rootstocks do not represent an early division of the genus into separate branches. Early irises were probably all beardless and all grew from rhizomes. These evolved into several different branches still having these basic characteristics, and then some of these branches gave rise to offshoots with deciduous foliage and bulbs as an adaptation to climates with very dry summers. So spuria irises are more closely related to Dutch irises than they are to Siberians, for example. Crested irises arose in more than one branch of the family tree, and are not a precursor to the development of beards. The earliest group to branch off from the others is represented today by Iris unguicularis and the closely related Iris lazica. If you want to have a mental picture of what the ancestor of all irises was like, Iris unguicularis is a good candidate. Next, the family tree split into two branches, one of which spread mostly westward in the vicinity of the Mediterranean, while the other spread mainly northward and then east into northeast Asia and eventually North America. The Mediterranean branch produced the bearded, oncocyclus, and Regelia irises, but also gave rise to the Junos, and apparently the crested irises of east Asia, such as Iris japonica and Iris wattii. These are actually more closely related to the Junos (which also often sport crests of various sorts) than to any other groups. Interestingly, one small branch of this group gave rise to both Iris dichotoma and Iris domestica, once thought to be so dissimilar that they were each placed in their own genus! 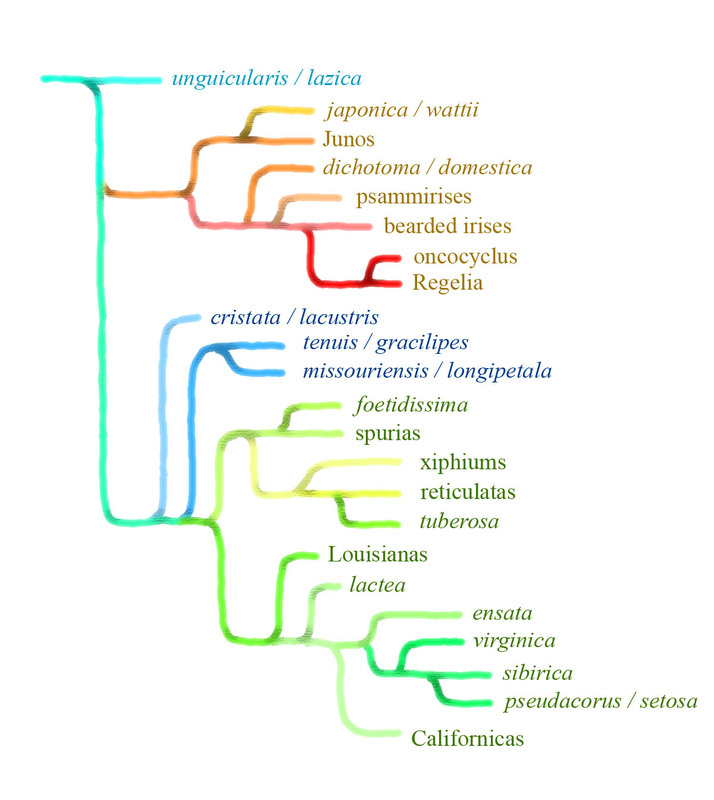 Meanwhile, the Asian branch of the genus led to the spurias, xiphiums, and reticulatas, plus most other beardless species. The migration of irises into North America was apparently not a single event, as there is no single branch of the iris family tree that has all the American irises and no Asian iris. The American crested irises, including Iris cristata, have the oldest lineage, but they do not seem closely related to the east Asian crested irises, as was once supposed. The crest feature developed independently in these two distantly related branches. A second venerable branch of irises in north America includes Iris missouriensis (the Rocky Mountain Iris), and the western species Iris tenuis. The Louisiana irises represent another early branch of the evolutionary tree. 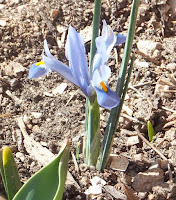 The other North American irises were presumably later arrivals, with close cousins in Asia. Iris virginica is related to the Siberian Irises and to Iris pseudacorus; this Asian-American grouping has a common ancestor with both the Pacific Coast group and also with the widespread Asian Iris lactea. Bearded Irises. 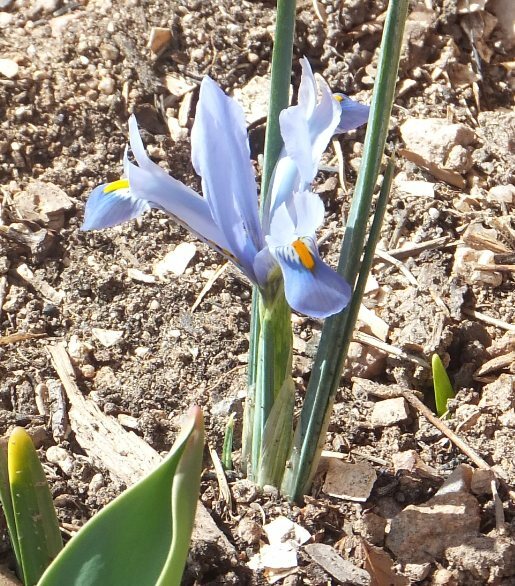 The bearded irises grow around the Mediterranean, with some species ranging northward into central Europe. The tall bearded irises were the first to attract the attention of European nurserymen and plant breeders in recent centuries, and they are the most represented in our gardens today. There was probably an earlier division of bearded irises into dwarf species with a basic chromosome count of 8 (Iris attica, Iris pseudopumila, and Iris pumila, which apparently arose as a tetraploid hybrid of the first two) and other species (mostly taller and branched) with a basic chromosome count of 12. It is from this latter branch that our modern TBs, BBs, and MTBs are directly derived. The chart of bearded iris relationships here is not from DNA studies, but based on chromosome analyses, geographical considerations, and other suppositions. In the big picture over long time scales, we think of evolution as a branching tree, where populations divide, become isolated, and go their separate ways to form new species. But if we look at the process in more detail, we see that species sometimes come about in other ways: as hybrids of earlier species, by polyploidy (doubling or otherwise increasing the number of chromosome sets), or by both these processes at once. The relationships among the bearded irises, for example, sometimes resemble a branching tree, but in some instances are more like a network, which species separating and then coming back together to make new species. Evolution is an intricate process. Irises, being prized as garden flowers, have attracted the attention of human breeders. When looking at the difference between modern hybrid TBs and their wild predecessors, it is tempting to see a new, accelerated evolution now dominated by human intervention. But although the effects of human breeding efforts are dramatic, it remains to be seen what impact they will have in the long term. Our own genus Homo is perhaps 3 million years old; the genus Iris has been here about fifteen times as long already. The last two centuries of iris breeding, compared with the 45-million-year evolution of the genus, is a very tiny fraction indeed (the same as about half a second out of a day). The irises humans have created mostly depend on humans for their existence—you find them in gardens, and sometimes in old cemeteries, but they have yet to take over the Asian Steppes or the Amazon. Will there still be irises 5 million years from now? 20 million years from now? Will our present interest in them leave any traces that far in the future? Plate tectonic maps by C. R. Scotese, PALEOMAP Project (www.scotese.com). Used with permission. It is interesting that the bulbous species aren't close to the Junos. I left it off so as not to overcomplicate the graphic, but it's apparently an early offshoot of the branch that leads to the reticulatas, xiphiums, and tuberosa. Thank you, Tom, for a very interesting, insightful article. I enjoyed it. Thank you so much for this article. It is a wonderful rendition of Iris history and quite outstanding. Thank so much,Tom. Very good article. Fascinating thank you for valuable info!